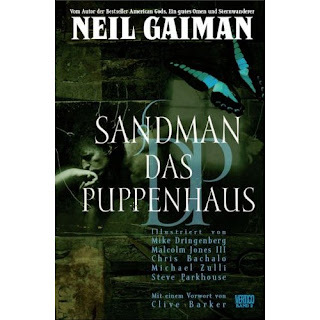 The second part of the "Sandman" series continues, and even enhances, what Neil Gaiman has begun with "Preludes and Nocturnes". He concentrates more on developing really interesting characters, and behind the main story of Rose Walker who has become a dangerous dream vortex which has to be taken care of, there are many side stories that are more than entertaining. For example telling the "real" story of Little Red Riding Hood or writing about the happenings at a convention of serial killers. What I liked best is the portrayal of Hob Gadling, a guy who someday decides not to die - and really is successful with his approach and finally even becomes a friend of the Sandman, meeting him in a pub once in a century. I enjoyed reading "The Doll's House" even more than the first part and I can't hardly wait to read book 3 (Dream Country).